We arrived safely into Bali, Indonesia after a very long, somewhat turbulent flight. 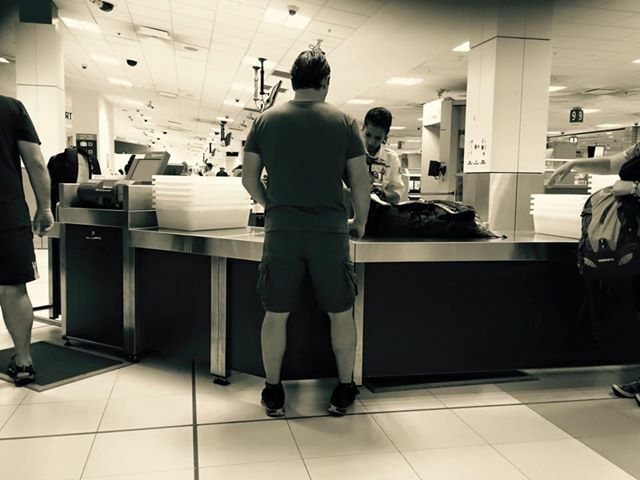 The troubles began at the airport, where Ryan was first pulled aside for a special screening, and then they went through his bags thoroughly, getting rid of some of his prized items. We were somewhat surprised, as I am usually the “suspicious” woman of interest, but this time it was his turn. After we finally cleared security, Ryan got himself a much needed hot cup of coffee and we settled in for a long wait, but apparently the airlines had another agenda. Within five minutes of sitting at our gate, thinking we had 45 minutes before they began boarding, the first call to board came! What?! For whatever reason, Jetstar chose to board early. The process went rather smoothly and we were on our way from Sydney to Bali, half an hour prior to our scheduled departure time. That was a first. The only disappointment was Ryan being asked to throw away his brand new just-bought steaming hot cup of coffee, as they didn’t allow hot beverages on board. Boy…Ryan was not having a good morning! We were sitting on the right side of the plane, and had an amazing view of Sydney. Sadly, I had my camera stowed away, so I missed a really great opportunity to get photos. It only occurred to me after prime viewing time that I could use my telephone. Ah well. Here’s the best that I got. 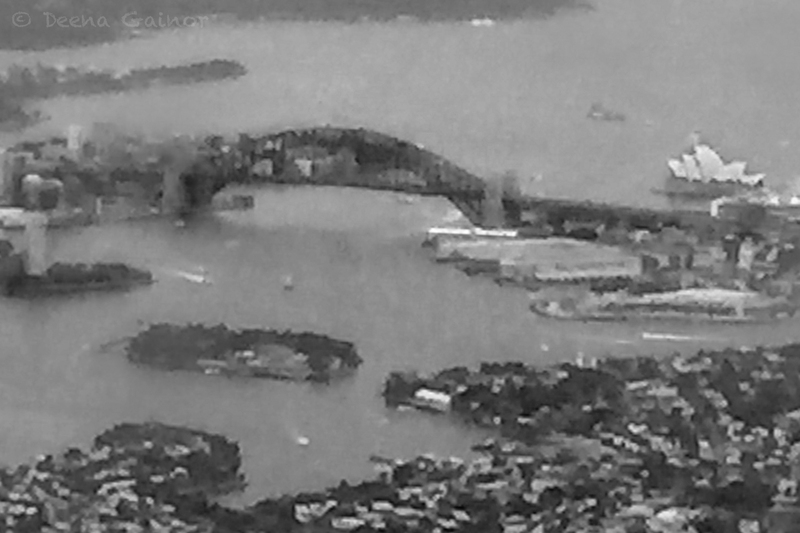 There’s the Harbor Bridge and the Opera House, icons of Sydney. We are so thankful to be “home.” We were able to get wonderful travel agent rates at the Sofitel Bali, so we are now enjoying a few days of relaxation, work, and just catching up. Below is our first meal in Indonesia. Delicious Red Snapper with a full set of sharp white teeth, as well as Indonesian Chicken Curry and Fried Rice.” Delicious! And the price tag shocked us. We went from $18 – $22 plates in Australia and New Zealand to the equivalent of $5 – $8 at the hotel restaurant. We can’t wait to explore more of Bali!